Try the Pesca Sipper for a deliciously fragrant mocktail that balances the best of zesty citrus and floral sweetness. 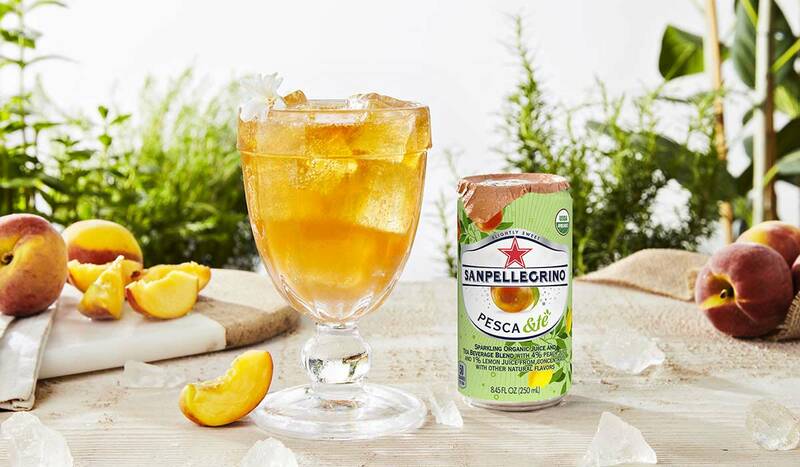 Sanpellegrino® Pesca &tè with jasmine and pleasantly bitter grapefruit add a complexity to sparkling peach tea. Pesca Sipper is one that’s sure to impress when you have guests over at any moment of the day. Sanpellegrino® Pesca &tè’s delicate tea shines alongside jasmine, while peach and pink grapefruit bring a richness with a touch of bitterness to the Pesca Sipper mocktail. Notes of sweet, floral, tart come together in a sublime pairing that will add sparkle to any special occasion, or casual get-together. Try it alongside our easy recipes such as arancini alla norma, the Sicilian-inspired Alici nella Meraviglia or any of our other Zesty Food suggestions and let the Italian carefree spirit into your home. Pour the syrup and juice into a tall glass (13 oz capacity). Stir well using a bar spoon and fill up with ice. Top with Sanpellegrino® Pesca &tè and garnish with a jasmine flower (optional). If you are 21 years old or over you can turn the Pesca Sipper into an alcoholic drink by adding 1 oz of London Dry Gin and stir well.